Energy efficiency has always been important, but it matters now more than ever. Considering energy consumption accounts for the majority of the average household costs in America, making your home more energy-efficient helps you save your hard-earned dollars. In turn, you enjoy better comfort in the process because you become in more control of your indoor climate. Moreover, investing in energy-saving home projects, like Low-E windows installation, helps slow down climate change, which is a global concern. Energy-efficient retrofits generate local jobs too, giving the growing construction and home improvement industries a boost. One of the reasons older homes are inefficient is because of old, outdated windows. Modern products feature long-lasting and low-maintenance frames as well as reflective and insulative glass. If you still have aging, single-pane windows, keeping them or replacing them in kind would waste your energy and increase your cooling needs unnecessarily. At Renewal by Andersen of St. Louis, our custom replacement units bear the ENERGY STAR label, ensuring they meet our local climate’s energy efficiency requirements. From our double-hung to casement windows, all of our products have excellent NFRC ratings. They feature remarkable performance in critical areas to combat unwanted heat gain, increase thermal insulation, and maximize daylighting. Installing ENERGY STAR-certified glass doors would help drive noticeable energy bill reductions down month after month. Like our windows, we use our advanced High-Performance™ Low-E4® glass packages on all our replacement patio door styles. They block the sun’s undesirable rays without affecting the quality and clarity of your outdoor views. Designed for maximum weathertightness, they’d trap your conditioned air in and keep unwelcome drafts out for your comfort. 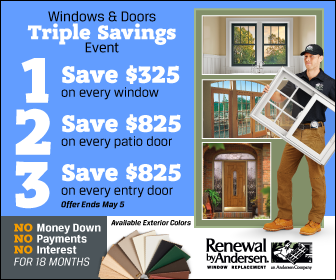 From the multi-awarded corporation, Andersen, Renewal by Andersen of St. Louis is the true home of energy efficient windows and patio doors. Stay tuned for the second part of our special blog about energy efficiency. To talk about your window and door project in Missouri, call us today at (314) 332-2364 to set your appointment in St. Charles, MO. We’ll be happy to schedule your FREE, in-home consultation at your convenience.